A path leading into the forests of Naikoon Provincial Park in Masset, Haida Gwaii. Growing up on Vancouver Island, British Columbia, I found it easy to mock visitors from abroad. "This place," they'd whisper. "I can go swimming in the morning, skiing in the afternoon, then kayak home for dinner." The views, the landscape, the wildlife — that was the refrain. Even in the cities, the scenery dominates. On any clear afternoon, look up from the streets of downtown Vancouver and you'll see the snowcapped North Shore mountains glowing pink, an ostentatious show of natural beauty so commonplace that most residents barely take notice. There were times when visitors' compliments sounded like admiration for a two-dimensional backdrop. But B.C. is a complex place, especially when it comes to its aboriginal communities. With a population of just over 4.5 million, the province is home to around 230,000 aboriginal people from 203 different First Nations, who among them speak 34 languages and 60 dialects. Today, these groups live a life of ostensible equality, but centuries of oppression — referred to in official circles as "alien modes of governance" — began a cycle of social devastation that hasn't yet been fully resolved. In many aboriginal communities, poverty, homelessness, and substance abuse still loom large. Indeed, residents of B.C. live in a province of uneasy contrasts. My village on the island was a haven of middle-class comfort, bordered by the poverty of a First Nations reserve. As a child, I walked down the stony beach and saw wealth and privilege give way to sudden hardship. This, I was told once, was my first experience of apartheid. As an adult I spent more than 15 years living outside Canada, and from time to time I would catch a glimpse of the ancient cedars and airborne orcas used to advertise my home province. I wondered which B.C. the visitors were coming to see. Was it possible to engage with the region's complexities and to approach its original residents in a way that went beyond the superficial? If I was asking that question of others, I realized, I first needed to answer it myself. So I planned a trip that took me from mid-Vancouver Island, the land of Snuneymuxw and Snaw-Naw-As First Nations, north to Port Hardy, then on to the remote, fog-shrouded islands of Haida Gwaii, home of the formidable Haida people, to find out whether it was possible for a visitor to take in B.C. 's nuanced human stories while still keeping those forests and snowcapped peaks in view. Port Hardy, a seaside town of 4,000 people on the northern tip of Vancouver Island, is today known as a destination for storm-watchers, sport fishermen, and hikers, though the place has retained a plaid-shirt solidity that reflects its past as a center for logging and mining. Outside the airport I was met by Mike Willie of Sea Wolf Adventures. Willie is a member of the Musgamakw Dzawada'enuxw First Nation, and he runs what he calls boat-based cultural tours across the waters into Kwakwaka'wakw territory. That includes the village of Alert Bay, the Namgis Burial Ground, with its totem and memorial poles, and the unpredictable waters nearby. He goes from Indian Channel up to Ralph, Fern, Goat, and Crease Islands, and as far north as the Musgamakw Dzawada'enuxw territory, also known as the Great Bear Rainforest — a 25,000-square-mile nature reserve that is home to the elusive white "spirit" bear. 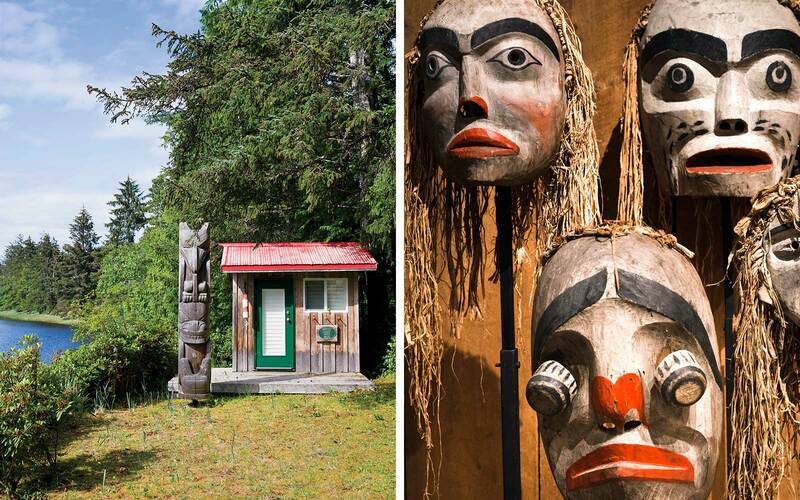 From left: A pole on the grounds of a waterfront home on Haida Gwaii; wooden masks carved by the Kwakwaka’wakw First Nation on display at the U’mista Cultural Centre in Alert Bay, off Vancouver Island. I'd arranged to travel with Willie to the U'mista Cultural Centre in Alert Bay, as well as to Village Island, the site of an infamous potlatch — a feast and gifting ceremony through which First Nations chiefs would assert their status and territorial rights. (Potlatches were banned in 1884 by the Canadian government, on the grounds that they were contrary to "civilized values." The ban was repealed in 1951.) As we set off, Willie told me about the ceremony. "The potlatch was an opportunity to reaffirm who you were," he said. "It was a way to get through the harsh winters. We gathered: that was the medicine." Willie took me to my lodgings, a beachfront cabin at the Cluxewe Resort outside the logging town of Port McNeill. The resort was comfortable but definitely designed to propel visitors outdoors. (A note inside my room reminded guests to please refrain from gutting fish on the porch.) I spent the evening reading, accompanied by a soundtrack of waves sweeping the beach outside, and the next morning, I took a walk along the stretch of pebbly Pacific shore in front of my cabin. I wanted to reacquaint myself with the past, inhale the moisture in the air, smell the cedar. Up above, unhurried eagles swooped, exuding a proprietary air as they circled and fell and circled again. As I walked, it struck me that this beach, like so many others, has been home to the Kwakwaka'wakw people for thousands of years. Canada, on the other hand, turns a mere 150 this year, and it seemed to be a good time to reflect on the nation's progress. The contrasts and contradictions I found in B.C. are playing out on a national scale. The Truth and Reconciliation Commission of Canada, set up as a response to the abuse inflicted on indigenous students in residential schools, concluded its findings in December 2015, attempting to redress the legacy with 94 Calls to Action. The Idle No More movement has been applying the spirit of Occupy to the issues facing First Nations through a series of rallies and protests. Meanwhile in B.C., tourism revenue is expected to double in the next 20 years, with the aboriginal sector playing a starring role. (This year it is forecast to bring in $68 million.) Something is happening. This is not about "having a moment"; moments recede. This is a long slog for respect, an effort to change the way Canadians view the aboriginal community's land and lives. In preparation for our trip to Alert Bay, Willie drove me into Port McNeill for a breakfast of eggs and bacon at an unpretentious place called Tia's Café. The town is small, so it wasn't a huge surprise when Willie's uncle Don wandered in. He told us there was excitement up in Kingcome, site of the family's First Nations community. He said the oolies, or oolichans — smelt fish used for making oil — had arrived, and the villagers were out fishing last night. "Sea lions were spotted in the river," Uncle Don said. "It's strange to see them up that high." "And there's excitement?" Willie asked. Don raised an eyebrow. "Oh sure." 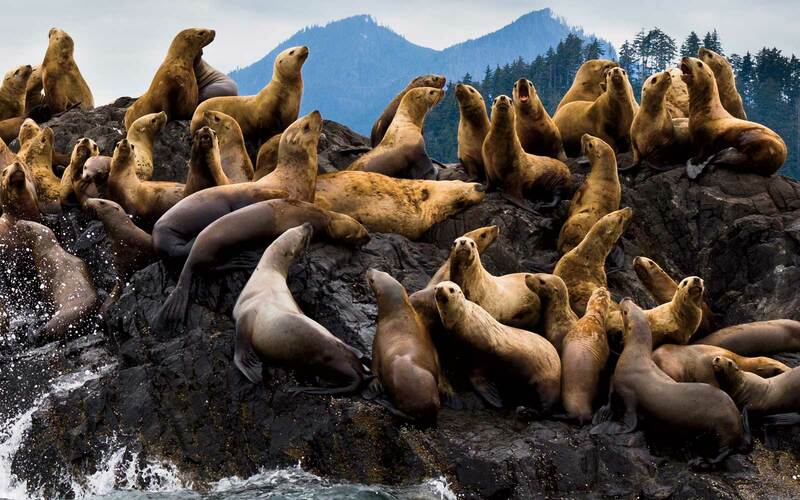 Sea lions gather on a rock near Windy Bay, off the coast of Haida Gwaii. Willie came to the guiding business in an organic way. In 2013, he started a water-taxi service between Alert Bay and neighboring Telegraph Cove, and en route he'd tell passengers about Kwakwaka'wakw life. Back then, the creaky remains of the notorious First Nations residential school in Alert Bay, which housed aboriginal children from 1929 to 1975, were still standing, and visitors were sometimes moved to tears when he told them about the abuses that took place there. But there was so much more: the totem-pole ceremony; the death protocol; family crests. You can look at a totem pole and appreciate the art, Willie explained to his passengers, but true appreciation comes from an understanding of its meaning. As he put it, "Wouldn't you rather see B.C. through fourteen thousand years of history?" Inside the U'mista Cultural Centre, in Alert Bay, which was set up to protect the heritage of the Kwakwaka'wakw community, I walked among the masks — a collection of painted wooden beaks and faces peering forth into the dimly lit exhibition room. In this culture, masks function not only as decoration but also as a form of historical and legal documentation. They also serve as tools of social instruction. Willie and I stopped in front of Gwalkwamł, or the Deaf Man, a one-eared mask with a downturned mouth and wisps of black horsehair. "It shows a head chief of a clan," Willie explained. "He didn't want to hold a potlatch, and the clansmen weren't happy about that, so they killed him." The mask, worn during retellings of the story, became a warning. Back at the dock in Alert Bay, brightly colored houses huddled alongside boats ranging from weathered to freshly painted. As we left the harbor, Willie offered me pâté of wild sockeye salmon from the Nimpkish River, and I ate as much as I could before we began cresting waves. Over the roar of the engine, I asked him why interacting with tourists was important. "We need to be vocal," he said. "We need to talk about our evolution and bring people closer to our reality." Oral-history cultures, I was reminded, need audiences. "Every time we tell this truth," he said, "it's strengthened." We pulled up to a red-ocher pictograph on a rock face on Berry Island, and Willie cut the engine. The image depicted Baxbakwalanuksiwe', a crucial figure in Kwakwaka'wakw spirituality. Bestowed with the power to transform himself into multiple man-eating birds, and adorned with mouths all over his body, his imposing presence on the rock meant burial sites were nearby. "We need to be vocal," my guide told me. "We need to talk about our evolution and bring people closer to our reality." We finally put down anchor in a small inlet on Village Island, or Mimkwamlis. It was here, in 1921, that government agents raided a potlatch and arrested the hosting chief and 44 other members of the community. Of those arrested, 20 did time in a B.C. prison for the offense. We walked inland on a damp soil path that gave a little under each footstep, surrounded by the smell of blackberries ripening from their springtime red. We were headed toward the potlatch site, the remnants of a longhouse — a traditional family dwelling where up to 40 people would have lived. "Longhouse is a new term," Willie told me. "To us they were just houses." All that was left was a beam and some fire-cracked rock. "Deeper down," Willie said, "you'll find the ash and fish oil, the evidence of everyday living." The site was lush and green, the silence softened by the faint buzzing of bees. I tried to picture the ceremony that ended so badly that day. A member of the community, who is rumored to have been a Christian convert, had informed the police. The authorities forced the Kwakwaka'wakw to surrender their masks and carvings or go to jail. If entire tribes gave up their potlatch paraphernalia, individual members would have their sentences suspended. The objects from the raid were only recently returned to the community. "People lived a dual life," Willie explained. "I had an uncle who became an Anglican priest and also potlatched — he was a hereditary chief." We remained at the site a while longer, and I tried to imagine the informer sitting among their people, torn between her two worlds. Back in Vancouver that evening, I dined at a restaurant called Salmon n' Bannock, which has WE GOT GAME written proudly on its sign. Inez Cook and Remi Caudron opened the place when they realized there was no indigenous food on offer for the tourists who came to the city for the 2010 Olympics. Their remedy is a menu that includes bison, sockeye salmon, bannock (or unleavened bread) and even oolichans like the ones I saw glittering in the sunlight on the dock in Port McNeill. I met a friend at the restaurant, an academic who works at a local university, and explained to her that the oolies on the menu were wondrous fish that were probably being plucked from the maws of angry sea lions up in Kingcome as we spoke. When conversation turned to aboriginal tourism, she was skeptical. "I don't know if there is really such a thing as cultural tourism," my friend said as we ate the oolies, which were oily and smoky and delicious. "Whose life, after all, gets marked as ‘culture,' and whose remains unmarked?" I spent the night across town at Skwachàys Lodge, which advertises itself as a "fair trade gallery, boutique hotel, and an urban aboriginal artist residence." The building, owned and operated by the Vancouver Native Housing Society, contains 24 shelter-rate apartments for aboriginal people at risk of homelessness. There are 18 hotel rooms on the top three floors, which has walls hung with works by a team of aboriginal artists. My suite was near the smudging room, where cedar, sage, and sweetgrass are burned during traditional cleansing rituals. From left: Mussels at Cowbay Café, in the port town of Prince Rupert; a floatplane docks in Prince Rupert; Haida chief James Hart carves a totem pole on Haida Gwaii. The next morning I caught a flight to Haida Gwaii, an archipelago of around 150 islands that sits at the north of B.C. 's coastline, just south of Alaska. The islands are separated from the mainland by the capricious waters of the Hecate Strait, named after a British vessel that bore the name of the Greek goddess of magic and witchcraft. It's a region where weather slips around from hour to hour, and rain might appear six times in a day. Even the name of the islands has shifted — they were known as the Queen Charlottes after their "discovery" by the British in 1787. In 2010 they were renamed Haida Gwaii, or "islands of the people." The Haida are one of the most celebrated, and perhaps infamous, tribes of the Pacific Northwest. They've been dealing with the vagaries of the chilly Pacific for thousands of years and were known for their lightning raids up and down the coast, the islands acting as their launching point and fortress. They are said to have traveled in canoes wrought from a single cedar, each warrior rubbed down with grease and charcoal and wrapped in the hides of sea lions and elk to keep the elements at bay. At the time of first colonial contact, in the late 18th century, there were around 10,000 Haida, and the remoteness of the islands meant it was tougher for missionaries to spread the word to Haida Gwaii, though they did eventually make the journey. As did smallpox, which decimated the Haida in the 1860s. The population dipped to a mere 500 in 1900. Nowadays, signs of resilience are evident across the archipelago. When I was there, the carving house at the Haida Heritage Centre at Kay Llnagaay, an ancient village site, contained two new totem poles, the curving beak of an eagle emerging from fresh cedar shavings. I was staying in the town of Skidegate, on Graham Island, the archipelago's second largest. At my lodgings, Jags Beanstalk, I was met by the proprietor, Jags Brown. A rangy man with salt-and-pepper hair, Brown is a member of the Juus Xaayda clan; his Haida name is Yestaquana. When he was young, he became one of Haida Gwaii's first Watchmen, a group that protected the community's ancient sites. On his early travels around Gwaii Haanas, the island's national park, he would find bones and other moss-covered remains of smallpox victims in the brush; in one cave, he found a cedarwood box containing a shaman's wand. Back then, his group protected the sacred sites from looters and vandals. Today their role is to educate, offer marine forecasts, and make sure visitors don't leave any traces behind when they leave the park. 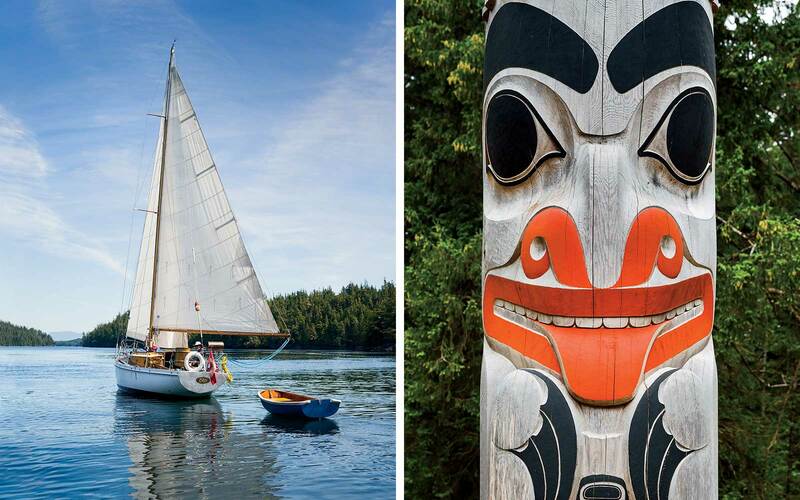 From left: Sailing the waters off Vancouver Island; a totem pole in Gwaii Haanas National Park Reserve, on Moresby Island, part of the Haida Gwaii archipelago. If you want to go somewhere in Haida Gwaii, it's best to learn the original name. Skedans, for example, comes from a European rendering of a chief's name; the traditional name, K'uuna Llnagaay, means "Village on the Edge," and in the 19th century, this wind-whipped peninsula was the winter home of around 450 Haida. Early one morning I headed there in a Zodiac, out past the village of Sandspit on a thudding journey of extraordinary beauty, islands looming and receding through the mist. Along the way a rainbow formed, and, in the waters just past Sandspit, I saw a humpback breach. There were once 26 longhouses on Skedans, each occupied by multiple families. Now evidence of that ancient populace has been reduced to the faint outlines of animal symbols on a group of towering, weathered totem poles: eagles, frogs, and killer whales. Unlike many of the world's cultural heritage sites, the poles of K'uuna Llnagaay are not roped off and protected; instead, in accordance with Haida beliefs, they have been left to collapse back into the earth. I'd seen totem poles my whole life, but never ones of this magnitude, left to disintegrate. Up close, even the cracks in the graying, weathered wood seemed to hold meaning. As Mike Willie said, an oral history needs to be repeated to ensure it is propagated, scattered around the world. The story of being on that beach, in the presence of those momentous totems and longhouse remains, is connected to stories that are inextricably linked to the geography of B.C. This place can never serve simply as a backdrop, and traveling to these beaches, through this water, forges those links again and again. In this province, listening pays off. The scenery's great, but the stories are even better. Masset and Sandspit are the two main airports on the islands of Haida Gwaii, off the coast of British Columbia. The Port Hardy Airport offers access to Port Hardy and Port McNeill. All are accessible via a connection in Vancouver. Haida Style Expeditions: Explore the waters of Haida Gwaii on a 28-foot Zodiac. Summertime cultural tours include visits to the villages of Skedans, Windy Bay, and more. from $275 per person. Sea Wolf Adventures: Learn about Kwakwaka’wakw culture throughout the Broughton Archipelago. You may spot a few grizzlies along the way. from $179 per person. Cluxewe Resort: Twelve cabins near Port McNeill with full kitchens and views of the Broughton Strait. cabins from $125. Jags Beanstalk: A collection of comfortable rooms upstairs from a café. Take advantage of the bike and kayak rentals. Skidegate; doubles from $125. Skwachàys Lodge: This boutique hotel in downtown Vancouver has 18 uniquely designed suites filled with aboriginal art. doubles from $189. Cowbay Café: Pasta, pizza, and locally sourced seafood, accompanied by B.C. wines and beautiful waterfront views. Prince Rupert; entrées $9–$22. Salmon n’ Bannock: Inspired by First Nations cuisine, the menu at this Vancouver favorite features hearty fare like boar meatballs and variations on bannock, the traditional First Nations unleavened bread. entrées $17–$35.